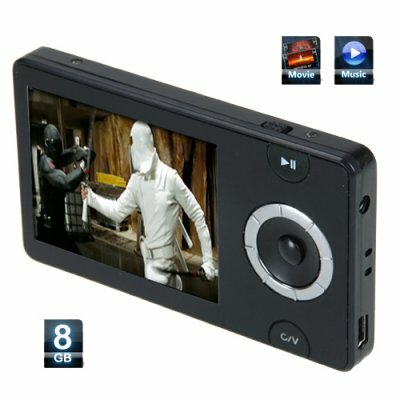 Successfully Added 8GB MP4 Player With Scroll Wheel + High Contrast Screen to your Shopping Cart. This portable media player (PMP) is an MP3 / MP4 player with a sweet 2.4 inch TFT display and nifty scroll wheel to enable simple navigation. What makes this PMP special? To begin with, this is a budget MP4 player with a high contrast screen that displays all your media with remarkably vivid intensity not seen in most media player screens, no matter what the price. In addition to the stunning display quality, the sound options are equally impressive. A wide choice of equalizer and 3D effects allow you to enhance digital music files to give a sound reproduction you never thought possible with an ultra-portable MP3 player. We should also mention that the case quality is also something not to be overlooked. A strong but light aluminum body is used to give this baby a durable and impressive look while the scroll wheel is smartly integrated into the body to handle normal usage with ease. The wheel itself has raised ridges to make it easy to use for hands of any size, while the central enter button is logically located for maximum convenience. All this in a PMP, but at a eye-popping low wholesale price, is it possible? Yes, it is!! Click "add to cart" now to get one for yourself and start really enjoying your free time! Impressive looking MP4 with stunning TFT display and scroll wheel navigation. Great portable media player (PMP) for handling digital sound and video files. Loads files via UDisk - meaning you load files onto the PMP in a file manager type system which is easy to use and love. No proprietary software is required.